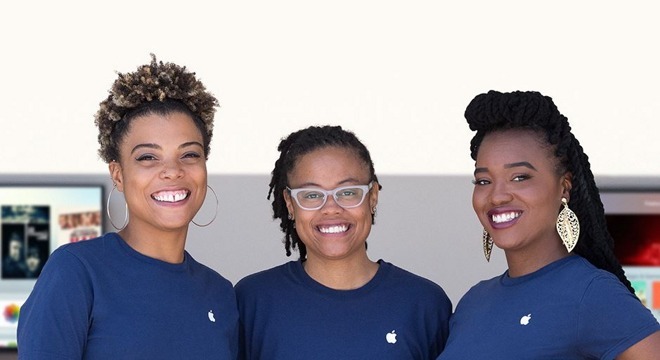 Apple on Wednesday published its latest "Inclusion & Diversity" update, showing small changes in the gender and racial makeup of the company, and the steps the company is taking toward equal pay for people with the same jobs and performance levels. As of June, the company was 68 percent male and 32 percent female, Apple said on its website. That's a shift of a single percentage point in favor of women. In the U.S., the company was 56 percent white, 19 percent Asian, 12 percent Hispanic, 9 percent black, and 2 percent multiracial, another 1 percent being gathered into an "other" category. Notably the company actually increased the percentage of white employees 2 points, although Asian and Hispanic numbers were up 1 point apiece. Less than 1 percent of American staff were undeclared, something Apple credits to "stronger internal processes and employees properly identifying themselves." Most of the people who were previously undeclared turned out to be white, possibly explaining the above demographic shift. On the pay equity front Apple claims that it has achieved total equity in the U.S. as of August, but is still working on the problem worldwide —this includes scrutinizing salaries, bonuses, and stock grants. There are no statistics on the company's pay gaps elsewhere. Like other tech companies Apple has sometimes come under criticism for being predominantly white and male in the U.S. In the past several years, though, the company has tried to adjust its hiring practices at all tiers. Its VP of Worldwide Human Resources, Denise Young Smith, is a black woman, and its retail head is former Burberry CEO Angela Ahrendts.